I have been reading this every time I’m in adoration these days. I find it quite encouraging, and I hope you do, too. In my daily life, I am constantly getting lost. Yet that means He can constantly find me. The more I need Him, the closer He is. I can ceaselessly discover that in weariness He sought me. This means loving until weary. Because of Original Sin He constantly searches for us to the point of weariness and exhaustion, humanly speaking. In the Eucharistic encounter, Jesus regularly finds me quite lost. Yet, I am normally lost, needing to be found. So no need for regrets. If I am lost I can only be found in Eucharistic love. He can only find me when I am lost and beginning to search for Him. Love needs two. It is a grace always given to me to seek Him through faith, hope, and love. Fr. Dajczer is here making a reference to the story of Jesus and the Samaritan woman in John 4. 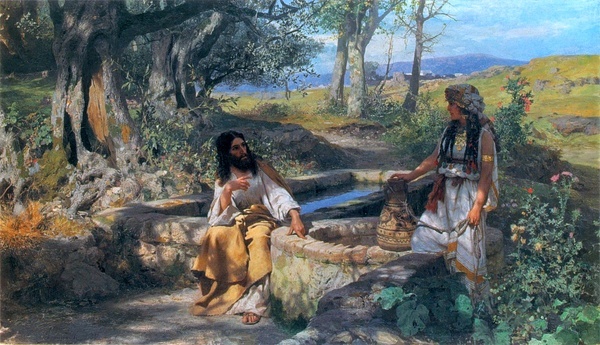 “Jesus, wearied as he was with his journey, sat down beside the well.” Augustine points out that Jesus is weary because He is on a journey to seek us each out. He is thirsty for our faith. He knows that we are lost and constantly sets out to find us. If you feel lost today, take heart that He is seeking you and looking for you. Let yourself be found by Him. I get so disheartened. I am frequently in touch with the Lord, yet I am always falling away from Him. I am always falling in the same old way. At times it seems I am getting worse. Furthermore, it is He who is inviting me to follow and unite with Him. I am not starting it. He is. He is the way; He is lighting the way. He is the grace that leads me on. I know so little about this because He doesn’t want me to know His mysterious operations within me. I ask how I can avoid getting so disheartened. Yet it is success that should really surprise me. I have to remember that the Lord only enters my heart through the failures that cause my spiritual emptiness. That is where faith comes in. He wants me to be inundated with problems so He can stay with me. Then I will want Him more and more. I need to be patient with myself. He doesn’t get disheartened with me, so why should I get so upset? He loves me just as I am. It is often hard for me to be forbearing [with myself], as I want everything immediately so that I am better than others. Yet God is not in a hurry. I am the hasty one with an interior hubbub. This impedes my spiritual progress. My impatience may look like zeal or even righteous indignation. I forget that this can be self-love or greed.